Ah, the hangover. Most of us have had one of these at one time or another after sucking down one too many at a bar or party. But what is this miserable reminder of the dangers of excess and what might we do (besides the most obvious solution: easing up on the sauce) to avoid this unfortunate consequence? 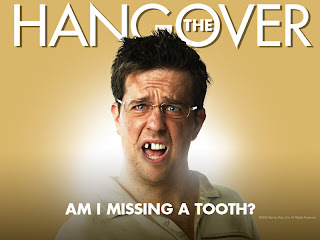 With The Hangover’s strong showing at the box office over the weekend, we thought it might be an interesting to look at the science of the hangover. We all remember a noble friend in college warning us – “Beer before liquor, never sicker. Liquor before beer, never fear.” Drink enough of anything, and clearly the mantra becomes moot. But is there any scientific basis for this commonly held notion? “Yes!” is our unexpected answer. One of the contributing factors to hangovers is congeners, toxic chemicals formed during the fermentation process. Not all alcohols are created equal when it comes to concentration of congeners: vodka has the least, followed by gin, while scotch whiskey, brandy, rum, and single malt scotch have four to six times more congeners than gin. Per the British Medical Journal, you’re more likely to get a hangover from drinking brandy, followed by red wine, rum, whiskey, white wine, gin and vodka. And it really is not a good idea to mix booze, since this makes it harder for your body to process all the varieties congeners. Do congeners lead to hijinks with Mike Tyson, babies, and tigers? Not a doubt in our minds. As for taking “a hair of the dog that bit you” to remedy a hangover, this does work at easing the symptoms of a hangover, but ultimately it just postpones the inevitable. Drinking lots of water before retiring for the night can counter alcohol’s dehydrating effects — another contributing factor to hangovers — and drinking coffee the next morning might only make it worse, since both alcohol and caffeine are diuretics. Of course, if you seriously find the formula for heavy drinking with a lesser hangover truly life-changing, you might want to consider a greater issue in your life… Ultimately, the best defense is not to over-indulge in the first place. “Moderation in all things,” as our good friend Epicurus once said. One leaves one’s college years behind, and discovers the joys of quality over quantity.